EagleMed is a privately owned and operated air medical transport service. A subsidiary of Air Medical Group Holdings since August 2009, EagleMed has been in business for over thirty years. The company began operations in 1977 and conducted its first “dedicated” air medical transport patient flight on September 1st, 1981. 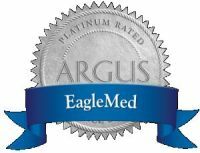 EagleMed is accredited by the Commission on Accreditation of Medical Transport Services (CAMTS) and dedicates all facets of the company towards providing the highest quality patient care in the safest environment possible. One of the oldest and most experienced air medical transport service providers in the Midwest, EagleMed operates an extensive fleet of Beechcraft King Air fixed wing aircraft. All aircraft are completely configured and medically equipped for mission critical transports that transform the aircraft into a “flying ICU”. An accident or illness can occur unexpectedly in our lives. Protect you and your loved ones today. With multiple bases to serve the communities throughout the United States, EagleMed crews are ready to respond 24 hours per day, 365 days per year. Our medical crews are trained and experienced to provide care for pediatric, trauma, cardiac, orthopedic, burns and other types of medical emergencies. To access an EagleMed air ambulance for patient transport, please contact the EagleMed Communication Center at 1-800-525-5220. Find out how to have no out of pocket expense for an air medical transport by EagleMed or other AMGH companies. EagleMed has 23 bases in a 7 state area across the Midwest and Southeastern United States. Although the primary service area is the Central United States, the flexibility of both helicopters and fixed wing aircraft allows EagleMed to provide timely transport to anywhere in the country. Qualified investors of Air Medical Group Holdings, Inc. ("AMGH") can log into our Intralinks site to stay updated on the financial results and major developments of the company. CAMTS Accredited since 2000 (Commission on Accreditation of Medical Transport Services). Founded In 1977 In Wichita, KS – Air Medical Services for over 30 years. Subsidiary of Air Medical Group Holdings since August 2009. Association Air Medical Services (AAMS) 2000 Safety Award.